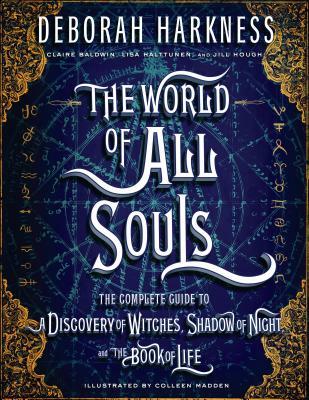 A fully illustrated guide to Deborah Harkness's #1 New York Times bestselling All Souls trilogy—"an irresistible . . . wonderfully imaginative grown-up fantasy" (People). A Discovery of Witches introduced Diana Bishop, Oxford scholar and reluctant witch, and vampire geneticist Matthew Clairmont. Shadow of Night and The Book of Lifecarried Deborah Harkness's series to its spellbinding conclusion. In The World of All Souls, Harkness shares the rich sources of inspiration behind her bewitching novels. She draws together synopses, character bios, maps, recipes, and even the science behind creatures, magic, and alchemy--all with her signature historian's touch. Bursting with fascinating facts and dazzling artwork, this essential handbook is a must-have for longtime fans and eager newcomers alike. Deborah Harkness is the number one New York Times bestselling author of A Discovery of Witches, Shadow of Night, and The Book of Life. A history professor at the University of Southern California, Harkness has received Fulbright, Guggenheim, and National Humanities Center fellowships.